07-Apr-2018, CROMWELL, CT: InnoTech of Pawcatuck, CT, has announced the launch of a new website for the CT Association of Plumbing Heating & Cooling Contractors. Founded in 1890, the Connecticut Association of Plumbing, Heating and Cooling Contractors is dedicated to the promotion, advancement, education and training of the industry for the protection of our environment and the health, safety and comfort of society. The Plumbing-Heating-Cooling Contractors â€“ National Association is America's premier trade group for the p-h-c professional. PHCC has almost 4,000 open and union shop contractor members who successfully manage businesses in residential service and new construction, commercial and industrial markets. 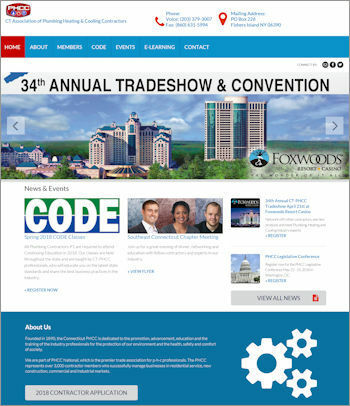 InnoTech was responsible for designing, implementing, and deploying this new, mobile-friendly website. We will now provide all on-going maintenance of the website, as well as domain name management of all the associated domain names. Lastly, InnoTech will also provide hosting and administration for the email accounts used by the management staff of CT-PHCC.